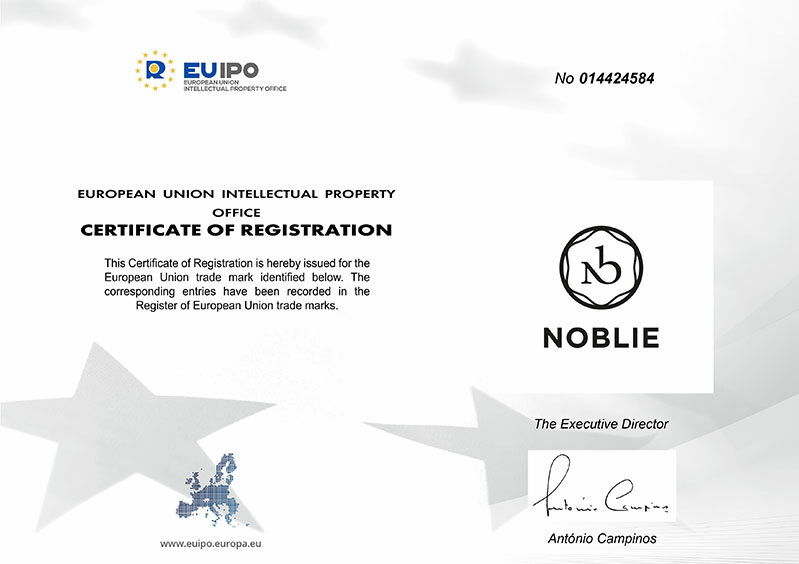 NOBLIE is registered trade mark for exclusive collectibles. We offer to the discerning art lover a select group of arts and crafts that serve as symbols of strength and nobility. Our company name originates from a French phrase “Noblesse oblige” literally meaning “Nobility obliges”. “Oblige” is the gracious gesture of nobility to share all the beautiful things. We created our logo to symbolize a coat of arms where each element reveals its own meaning. The oak leaf represents longevity and strength. The leather stands for quality and beauty. The vine is the abundance of fertility and peace. All these symbols are blended in the circle of infinity with the monogramed letters N and B. We would like for you to enjoy the grace and beauty of our goods and appreciate the great mastery implemented in every single detail in these exquisite collectibles. Welcome to NOBLIE! By the rights given to us from the certificate below we are the proud and responsible owners of the brand name and logo NOBLIE.